In a food processor or blender, mince garlic. Add the rest of the ingredients except water and tofu. Blend well, adding water as needed to make a thick marinade. In a pie pan or shallow bowl, coat tofu with peanut sauce mixture and marinade for at least an hour. Note: refrigerate if marinating longer than one hour. 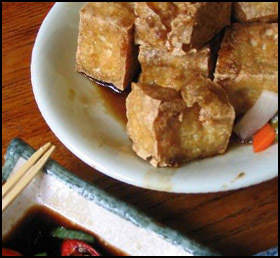 Preheat oven to 400º F. Without overlapping, place tofu on an ungreased sheet pan and bake for 15 to 20 minutes, or until peanut coating has hardened slightly.